Which upcoming ROH Live Cinema Relay is perfect for you? 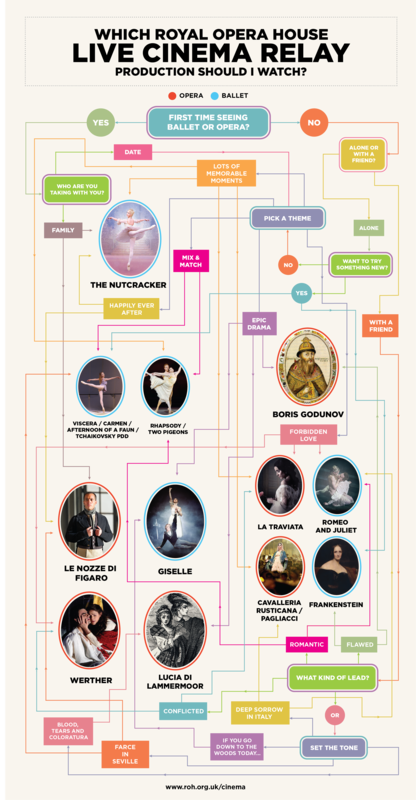 Use our decision tree guide to pick your ideal Royal Ballet or Royal Opera live cinema relay during the upcoming 2015/16 Season. With the Royal Opera House's 2015/16 Season just around the corner comes, the start of a new ROH Live Cinema Season is close behind. In the course of the coming year we'll be relaying Royal Opera and Royal Ballet productions to thousands of cinemas in more than thirty-five countries around the world. 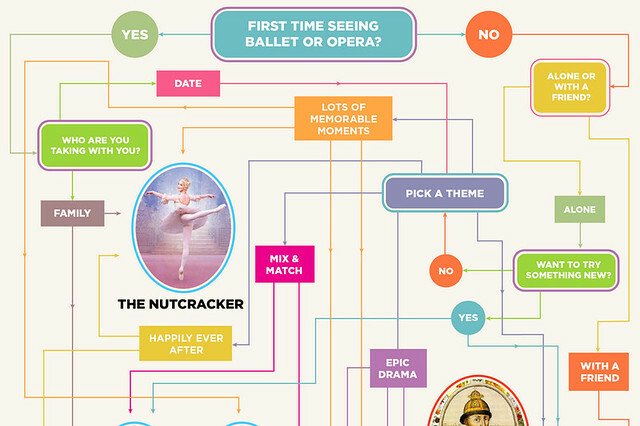 We've worked with bloggers The Ballet Bag to create a decision tree to help you pick the perfect live relayed production for you. Whether you're going with the family or on a date, are after something to tickle your funny bone or send tears running down your face, we've got all bases covered. The 2015/16 Live Cinema Season will see 12 ROH productions relayed live to more than one thousand five hundred cinemas in more than thirty-five countries around the world. Find your nearest cinema and sign up to our cinema newsletter for updates direct to your inbox. will Romeo andJuliet be issued as a DVD? We have no news on this at the moment, but do keep an eye on these pages and our social media channels as any new DVD/Blu-Ray releases will be publicized. Hi, we're in Jersey CI and are devastated that cineworld here is not screening Romeo and Juliet on 22nd September. How are we able to access this performance? Recently Cineworld did reinstate a cinema which they had removed for this season due to pressure from the local public so I'd encourage you to contact the cinema directly in the hope that they'd do the same in Jersey.